Ohio State men’s basketball head coach Thad Matta announced on Monday that he is immediately stepping down from atop the Buckeyes program, citing an ailing back and recent recruiting woes as the reasons for the abrupt departure. Matta, who had success at Butler and Xavier before landing the job in Columbus, led Ohio State to a pair of Final Fours in 2007 and 2012, posting a record of 337-123 in 13 seasons of work. He turns 50 in July, but already has 439 wins to his name and a coaching tree that includes Arizona’s Sean Miller and Boston Celtics coach Brad Stevens. The past two years, though, (or the past four, depending which crazy Ohio State fan you’re talking to) have been rough for the Buckeye faithful. For the first time in Matta’s tenure, Ohio State failed to surpass the 20-win mark in 2017, finishing 17-15 and missing out on both the NCAA and NIT tournaments; in 2016, the Buckeyes lost in the second round of the NIT. Matta and his assistants have also struggled to recruit the nation’s top prospects as of late. In the three years since D’Angelo Russell committed in 2014, the Buckeyes have failed to secure a top-40 recruit, per ESPN’s rankings. Though Matta already has over 400 wins to his name and seemed to be on pace to spend the next 20-odd years climbing the all-time charts, he is also coming off a back surgery that limited the use of his right foot and left him with further complications. In March, he dismissed a report from Yahoo’s Pat Forde that health issues were affecting his ability to coach, telling reporters “I’m fine. Honestly, I feel really good,” per Cleveland.com. 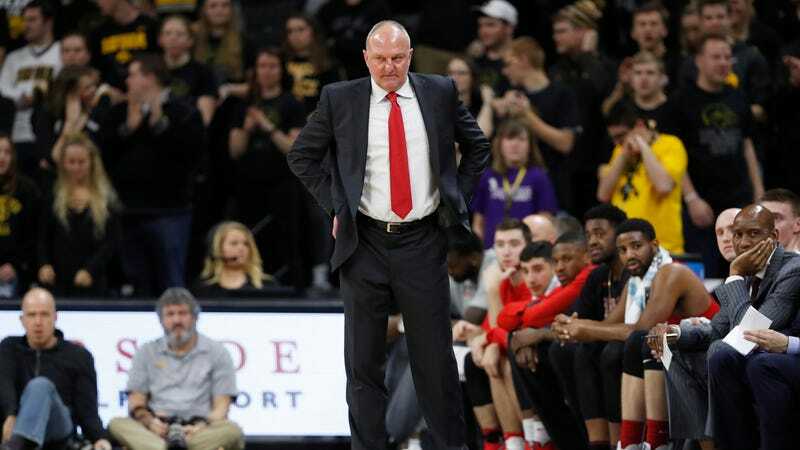 Sitting alongside athletic director Gene Smith, who claimed responsibility for the decision, a tearful Matta said that coaching “wears on you,” recounting numerous times he was forced to take pills and have shots administered prior to games in order to coach from the sidelines. According to Smith, the struggles Matta was having on the recruiting trail, paired with the recent disappointing seasons and personal health decline, served as the final straw. Ohio State will now move into the summer without a head coach and one player short of a full roster—the Buckeyes have just nine scholarship players after Matta and his coaches failed to land any big-name transfers or reclassified high school recruits this spring.